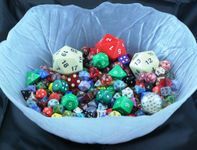 Second lot of 1 pound of assorted dice, mixed colors/patterns. That's just under half a kilo, for us "rest of the world". This lot is comprised of ALL DICE TYPES, you'll find d4s, d6s, d8s, d10s, d%, d12, and d20 (though likely a bit more d6/d10/d20)! Build inexpensive "loan" polysets your mindless players can borrow from. Or create a gorgeous table centrepiece to let all your guests know you're probably better qualified to debate Middle-Earth politics than Brexit.